Browser support for CSS scroll snapping has improved significantly since it was introduced in 2016, with Google Chrome (69+), Firefox, Edge, and Safari all supporting some version of it. This method is pretty limited. Since it only allows evenly-spaced snap points, you can’t really build an interface that snaps to different-sized elements. If elements change their shape across different screen sizes, you’re also bound to run into issues. At the time of this writing, Firefox, Internet Explorer, and Edge support the older version of the spec, while Chrome (69+) and Safari support the newer, element-based method. I’d argue a more flexible option is to use the element-based syntax exclusively and loading a polyfill to support browsers that don’t yet support it. This is the method I’m using in the examples below. Unfortunately the polyfill doesn’t come with a browser bundle, so it’s a bit tricky to use if you’re not using a build process. The easiest way around this I’ve found is to link to the script on bundle.run and initializing it using cssScrollSnapPolyfill() once the DOM is loaded. It’s also worth pointing out that this polyfill only supports the element-based syntax, not the repeat-method. As with any property, it’s a good idea to get familiar with the values they accept. Scroll snap properties are applied to both parent and child elements, with specific values for each. Sort of the same way flexbox and grid do, where the parent becomes a “flex” or “grid” container. In this case, the parent becomes a snap container, if you will. Here are the properties and values for the parent container and how they work. The mandatory value means the browser has to snap to a snap point whenever the user stops scrolling. The proximity property is less strict—it means the browser may snap to a snap point if it seems appropriate. In my experience this tends to kick in when you stop scrolling within a few hundred pixels of a snap point. See the Pen Scroll-snap-type “Mandatory” vs “Proximity” by Max Kohler (@maxakohler) on CodePen. If that container is set to scroll-snap-type: mandatory, it will always snap either to the top of the element or the top of the one below, making the middle part of the tall element impossible to scroll to. By default content will snap to the very edges of the container. You can change that by setting the scroll-padding property on the container. It follows the same syntax as the regular padding property. This can be useful if your layout has elements that could get in the way of the content, like a fixed header. Now let’s move on over to the properties for child elements. This lets you specify which part of the element is supposed to snap to the container. It has three possible values: start, center, and end. These are relative to the scroll direction. If you’re scrolling vertically, start refers to the top edge of the element. If you’re scrolling horizontally, it refers to the left edge. center and end follow the same principle. You can set a different values for each scroll direction separated by a space. By default, scroll snapping only kicks in when the user stops scrolling, meaning they can skip over several snap points before coming to a stop. You can change this by setting scroll-snap-stop: always on any child element. 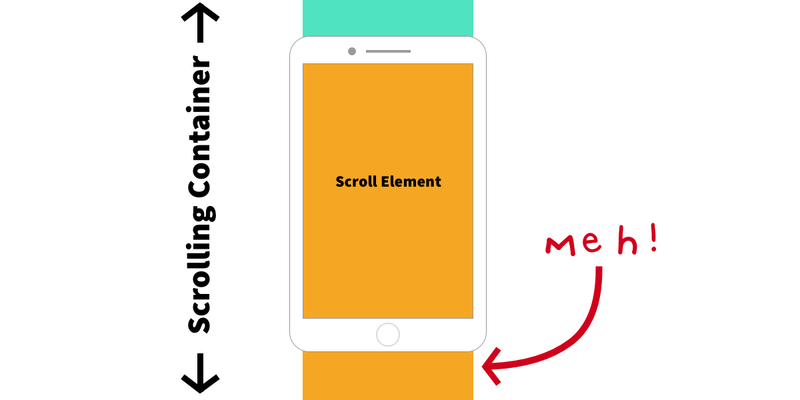 This forces the scroll container to stop on that element before the user can continue to scroll. At the time of this writing no browser supports scroll-snap-stop natively, though there is a tracking bug for Chrome. Let’s look at some examples of scroll snap in use. See the Pen Vertical List by Max Kohler (@maxakohler) on CodePen. To make a horizontal slider, we tell the container to snap along its x-axis. We’re also using scroll-padding to make sure the child elements snap to the center of the container. Then, we tell the container which points to snap to. To center the gallery, we define the center point of each element as a snap point. See the Pen Horizontal, different sized images by Max Kohler (@maxakohler) on CodePen. See the Pen Vertical Full-Screen by Max Kohler (@maxakohler) on CodePen. This is the same sort of concept as the vertical version, but with the snap point on the x-axis instead. See the Pen Horizontal Full-Screen by Max Kohler (@maxakohler) on CodePen. See the Pen 2d Snapping by Max Kohler (@maxakohler) on CodePen. Messing with scrolling is risky business. Since it’s such a fundamental part of interacting with the web, changing it in any way can feel jarring—the term scrolljacking used to get thrown around to describe that sort of experience. The great thing about CSS-based scroll snapping is that you’re not taking direct control over the scroll position. Instead you’re just giving the browser a list of positions to snap in a way that is appropriate to the platform, input method, and user preferences. This means a scrolling interface you build is going to feel just like the native interface (i.e using the same animations, etc.) on whatever platform it’s viewed on. There’s definitely some fancy maths going on to make this happen. Thanks to CSS scroll snapping, we’re getting it for free. Of course, we shouldn’t start throwing snap points onto everything. Things like article pages do just fine without them. But I think they can be a nice enhancement in the right situation—image galleries, slideshows seem like good candidates, but maybe there’s potential beyond that. 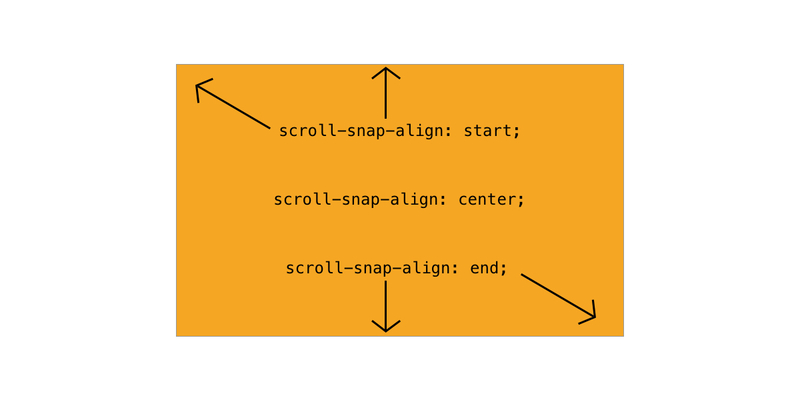 The post Practical CSS Scroll Snapping appeared first on CSS-Tricks.